Mahant Paramhams Ramachandra Dass, mercurial chief of the VHP-backed Ram Janambhoomi Nyas, today hit out at the VHP leaders who criticised the Prime Minister, Mr Atal Behari Vajpayee, and the BJP on the Ram temple issue but said the acquired land should be returned to him on the basis of earlier evidence and religious scriptures and not the ongoing excavation. 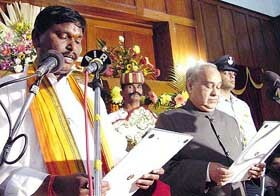 Joining the BJP just three years back, Mr Arjun Munda was today sworn in as the second Chief Minister of Jharkhand to take the reins of another NDA government, heading a six-member Cabinet that included three rebel ministers in the previous Marandi regime. Arjun Munda, new Chief Minister of Jharkhand, being administered the oath of office by Governor M. Rama Jois at Raj Bhavan in Ranchi on Tuesday. The clemency plea of Devinder Pal Singh Bhullar, sentenced to death by the Supreme Court, should not be sympathetically considered by the President, as this will send a wrong signal in the country’s fight against terrorism, said Mr Maninderjit Singh Bitta, the chairman of the All-India Anti-Terrorist Front, who was injured in a bomb blast in the days of Punjab terrorism. A two-day meeting of the national executive of the BJP, scheduled at Indore from April 4, is going to evolve the strategy for the Assembly elections in four states later this year. A POTA court will frame charges on Saturday against Aftab Ansari in connection with an alleged plot to assassinate President A.P.J. Abdul Kalam and kidnap Sachin Tendulkar and Saurav Ganguly even as he was produced in another Delhi court today in connection with charges of waging war against the country. Nagaland Chief Minister Neiphiu Rio today said the “unification” of Naga-dominated areas was “not a new issue” and had been agreed upon by the Centre in an accord in 1960. 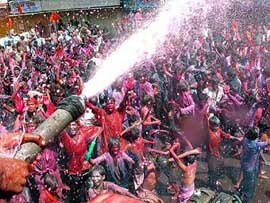 Revellers enjoy and dance in a procession taken out in Bhopal on Tuesday to celebrate Holi. 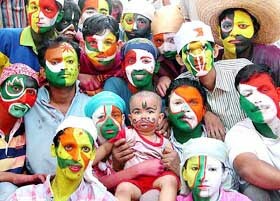 A group of youngsters with their faces painted to mark Holi, in Mumbai on Tuesday. Authorities in Dehra Dun raid a brick kiln and release 13 families of bonded labourers working there. The mahant, head of the powerful Digambari Akhara, who kept the entire country on the tenterhooks ahead of the much-hyped shiladaan last year, also announced his decision not to proceed with his threat to take the carved stones to the acquired land after March 27 even as he ruled out any dialogue with Muslims on the issue. “I don’t agree with some people in the VHP who criticised the Prime Minister and the BJP for backing out of their commitment. Mr Vajpayee became Prime Minister only after the BJP put behind its agenda and adopted the NDA agenda”, he told PTI in an exclusive interview here. Terming as “baseless” the charge that the BJP had raked up the temple issue whenever elections were around, the mahant, however, said, “the BJP lost four state governments for our cause”. “They are making all efforts to return the acquired land to us. It will be insincerity on our part if we do not support them, let us not forget that they are part of a coalition and have their own compulsions. “It is an irony that the Prime Minister, who is a neutral person, is attacked both by the opponents and proponents of the temple,” he said. Besides VHP leader Acharya Giriraj Kishore and Ashok Singhal, Mahant Dass himself has been highly critical of the BJP leaders, including Mr Vajpayee and Mr Advani, for allegedly betraying the temple cause and backtracking on their word to resolve the issue by the March 12 deadline last year. The 35-year-old Mr Munda, who as Welfare Minister in the Marandi cabinet, was administered the oath of office and secrecy by Governor M. Rama Jois at Raj Bhavan. Mr Munda was directed by the Governor to prove his majority on the floor of the House in seven days. “Now that a six-member Bench of the Supreme Court has dismissed the curative petition of Bhullar in the Indian Youth Congress (IYC) bomb blast case, the President, Mr A.P.J. Abdul Kalam, should reject the clemency petition, who has been convicted by the highest court in the country,” Mr Bitta told The Tribune. Outlining the procedure, he said the President would seek the views of the government, thus inviting political interference in the administration of justice. Political leaders would advise according to their narrow political considerations, he added. The Punjab Congress chief, Mr Hanspal, coming out in favour of commuting the death sentence of Bhullar into life imprisonment, Mr Bitta said, does not indicate the party’s commitment to fight terror, when leaders are coming out openly in favour of those convicted for terrorist acts. The meeting to be attended by Prime Minister Atal Behari Vajpayee, Deputy Prime Minister L.K. Advani and senior party leaders is expected to adopt two resolutions on the political and economic situation as also on the developments in the Gulf region. Madhya Pradesh, Rajasthan, Chattisgarh and Delhi are to go to the polls. The strategy for the Assembly elections as also the agenda for the national executive was discussed at a two-and-a-half-hour meeting today of party President M Venkaiah Naidu with General Secretaries Pramod Mahajan, Sanjay Joshi, Mukhtar Abbas Naqvi and Union ministers Arun Jaitley and Arun Shourie. “The meeting discussed the agenda for the national executive and also took a serious view of the role of the Jharkhand Speaker Inder Singh Namdhari,” Mr Naqvi said. Designated POTA Judge S.N. Dhingra fixed March 22 for framing of charges against Ansari, alias Farhan Malik, when he was produced before him today, 13 days after the court framed charges against his nine accomplices, including six Pakistanis, in the case. Earlier in the day, he was also produced before Metropolitan Magistrate M.C. Gupta in connection with a case of waging war against the country. Ansari was brought here by a Delhi police team last night from Kolkata where he is lodged in Presidency Jail in connection with January 22, 2002, American Center shootout case, in which he is the prime accused. However, he said “the integration process has to be worked out.... We have to discuss. We cannot take something by force, neither can we give away something to force. This has to be done through the will of the people,” he said at his maiden press conference here. 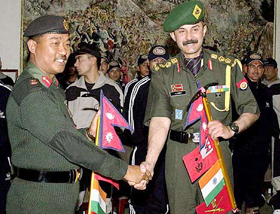 “Integration (of Naga areas) is a commitment of the Government of India. I am talking about Clause 13 of the 16-point agreement of 1960. The state Assembly has also passed resolutions to this effect thrice in the past,” Mr Rio, who met Prime Minister Atal Behari Vajpayee and his Cabinet colleagues here in the past two days, said. This statement of Mr Rio could again stir the hornet’s nest in the North-East. The Nagaland Chief Minister replied in the negative when asked whether he had raised the issue with Mr Vajpayee. Asked whether the issue was akin to the stand of the NSCN(I-M) on ‘Greater Nagaland’, he said “I don’t know about their demands, but it is not a question of Greater or Bigger Nagaland”. On the Naga peace process, Mr Rio said his government was committed to it and was considering launching a “peace mission” as was done by Jaiprakash Narayan, Reverend Michael Scott and B.P. Chaliha three decades ago. “Negotiations are on for a compromise.... There should be a give and take policy... and in a dialogue like this, nothing is impossible,” he said, adding that the peace talks were “going on in the right direction and we fully support the peace process”. To a question on reported threats to the newly elected legislators allegedly by the NSCN (Khaplang), he said the state government had not only raised the matter with the head of the Ceasefire Monitoring Group for strict adherence to the ground rules, but also asked the NGOs to “reason out” with the outfit and call for peace. “Our government is not against any faction. Rather, we want to bring them all together so that the Nagas have one voice.... We want to see that everyone becomes part of this (political) settlement,” he said in reply to questions. The Chief Minister said his government’s approach was to use the civil society and NGOs like Naga Hoho, churches, students’ organisations and human rights bodies to bring about unity among the “underground factions” of the NSCN. “A united overground civil society should carry forward the message to the underground factions and (strive to) bring unity among them so that they speak with one voice,” he said. On his meetings with Mr Vajpayee and others, Mr Rio said he had sought central help in meeting the “inherited” deficit of Rs 365 crore and the Centre had assured of necessary help.